I pray the forgiveness of Allah, my Lord, and I turn repentant to Him. and I turn in repentance to Him. so that I will hope for and fear none save You. and satisfaction with (Your) predetermination and decrees. and my brethren-in-faith and my family members. and all reason-based tendencies are wasted except those directed to You. So, You are the ultimate hope and to You is the resort. I am fleeing to You from myself. and of all those whose donations are expected by the desirous. let not falsehood bring arguments to corrupt my conduct. and the protections of the Successors from Mu¦ammad’s progeny, peace be upon them. and in their exoteric and their esoteric affairs. are just like Mu¦ammad, peace be upon him and his Household. Alternate translation :In the name of Allah, the Beneficent, the Merciful. O Allah send blessings on Muhammad and on the children of Muhammad. I seek the light of the morning under the protective shelter of Allah, under the watchful eyes of His Angels, under the safe security of His Prophets and Messengers, peace be on them, under the reliable surety of Muhammad, blessings of Allah be on him and on his children, under the trustworthy guaranty of the successors of Muhammad, peace be upon them, I believe in and rely upon “Aali Muhammad” whole heartedly, peace be upon them, publicly known, distinct, evident, perceived by hearts. I testify that they are signs of Allah, in His service, like Muhammad, blessings of Allah be on him and on his children. verily, it is Your will that is before all that. and whatever You do not will to have effect will never come to pass. O Allah, (please) forgive me and overlook my offenses. and whosoever You curse, then I invoke Your curse upon him. This act should be done once a month at least. 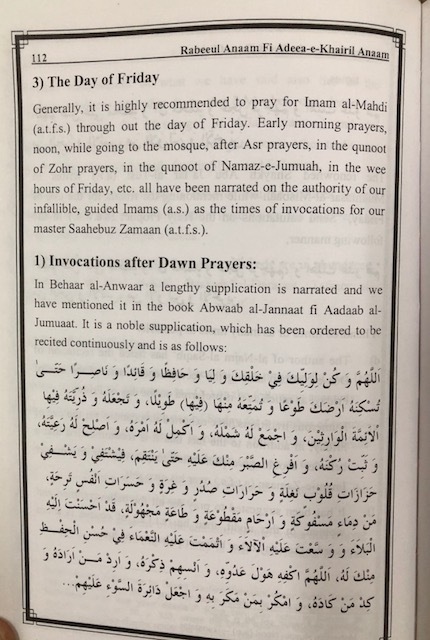 It has been also narrated that one who, after the accomplishment of the Dawn Prayer on Fridays, does devotional acts and says supplications and invocations until sunrise will be raised seventy ranks to the Supreme Paradise. my indigence, and my deprivation. Verily, I hope for Your forgiveness more than I rely on my deeds. Indeed, Your forgiveness and Your mercy are more inclusive than my sins are. and out of my urgent need for that. and none could ever repel evil from me save You. and I will then confess of my sins before You, except You. O He Who is ever-Favorer on the beings! O He Who is openhandedly Bestower of gifts! O He Who is the Giver of sublime donations! hardships, sorrows, misfortunes and calamities.O Allah! Send blessings on Muhammad and on the children of Muhammad. O Allah! Send blessing on Muhammad and on the children of Muhammad. Praise be to Allah, the Fore- most First (Ever-Existing) infinitely a priory to creation and life; the ultimate Ever-lasting, eternally beyond nothingness and death of all things, the Aware Who is never unaware of (the plight of) him who keeps him in remembrance, nor leaves him, who thanks Him, in the lurch, nor disappoints him who makes a request to Him, nor cuts off the hope of fulfillment from him who ask for a favour. O my Allah, I as Thee to give evidence, and Thy evidence is final, I call on all Thy Angels, the dwellers of the skies, the bearers of Thy "Arsh", Thy Prophets and Messengers sent out for conveying Thy message, and all forms of life Thou has created, to give testimony to my witness that Thou art Allah, there is no god save Thou, One; has no associate does not hesitate or pause, nor break Thy word (to fulfill a promise), nor has to do one thing instead of the other; that Muhammad (blessing of Allah and peace be on him and on his children) is Thy Servant and Messenger, to tell the people again and again that which Thou made him know, learn and refer to, and he struggled against all difficulties to strive in the way of the High and Mighty Allah, fulfilled his duty and got better of the enemies; indeed brought the good news through which reward had been made clear as a right, and called attention to the consequences whereby punish-ment become due as a sure penalty. O my Allah, So far I am alive keep me on the Right Path of Thy Religion, do not let change of heart make me go astray after Thou has guided me aright, and give me as a gift a share from Thy gentle mercy. Certainly Thou makes many presents. Send blessing on Muhammad and on the children of Muhammad, make me follow them and love them wholeheartedly, raise me for the last judgment along with their family, let me be in harmony with the fulfillment of Friday duties; and carry out obediently which has been made obligatory for me, on this day, and share the rewards to be bestowed on the deserving people (who had fulfilled its duties) on the Day of requital, Verily Thou art Mighty and Wise. My Allah send blessings on Muhammad and on his children, and allow me to get Thy consent as soon as the day breaks. Put Thy fear in my heart, cut off (desire of) everything other than Thee, so that it neither turns to, nor is afraid of anyone except Thee. My Allah send blessings on Muhammad and on the children of Muhammad. 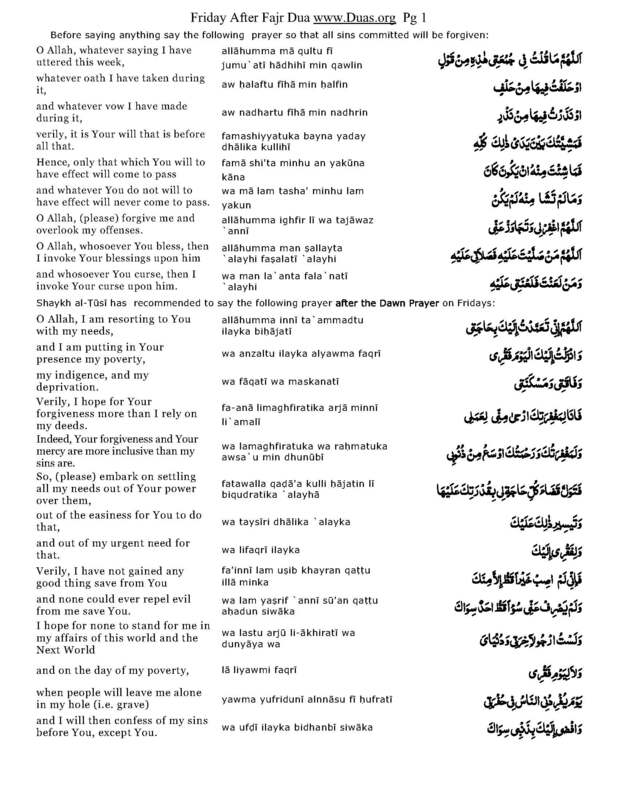 Give me resolute faith, genuine sincerity, distinction of believing in Oneness of Allah, durable honesty, inbuilt tendency and disposition to self-control and poise, whatever my share is in the Divine scheme of things and events..
O He who satisfies claims of those who come with their problems to make request for favorable settlement. O He who knows inside out the innermost longings of those who keep quiet. Send blessings on Muhammad and on his children, give answer to my prayer, and forgive my sins, multiply my means of livelihood, fulfill my desires, desires of my comrades-in-faith, and my kith and kin. My Lord and Master! Extraordinary efforts to obtain satisfaction of desires come to nothing unless Thou lends a hand. Total commitment to most rational planning goes waste unless Thou takes it up. O He who bestows benefits on him who comes near, O He Who gives more and more to him who makes a request; I seek refuge with Thee, from the bottom of my heart, O The last refuge of (all) fugitives, (who take to flight) under the pressure of sinful misdeeds, carrying the burden on their back. I know no one good for or useful to speak on my behalf to Thee, except my confident conviction that surely Thou does favor to them who turn to Thee to make a request,& makes sure that what they wish for is given to them. O He Who exposes the pitfalls of reason (if) awareness of Him is perceived; and makes speech meaningful (if) it sings His praises, and bestows benefits upon His servants that which serves the purpose, equal to what they have the right to. Send blessings on Muhammad and on his children; and let not Shaytan make a raid on my reason, and let not falsehood bring arguments to corrupt my conduct. My Allah send blessings on Muhammad and on the children of Muhammad. Give me resolute faith, genuine sincerity, distinction of believing in Oneness of Allah, durable honesty, inbuilt tendency and disposition to self-control and poise, whatever my share is in the Divine scheme of things and events. O He who satisfies claims of those who come with their problems to make request for favorable settlement. O He who knows inside out the innermost longings of those who keep quiet. Send blessings on Muhammad and on his children, give answer to my prayer, and forgive my sins, multiply my means of livelihood, fulfill my desires, desires of my comrades-in-faith, and my kith and kin. My Lord and Master! Extraordinary efforts to obtain satisfaction of desires come to nothing unless Thou lends a hand. Total commitment to most rational planning goes waste unless Thou takes it up. Highbrow brainy intellectuals turn surly and cynical unless Thou art referred to. So from Thee (we ) ask for everything, unto Thee (we) turn to. O He who bestows benefits on him who comes near, O He Who gives more and more to him who makes a request; I seek refuge with Thee, from the bottom of my heart, O The last refuge of (all) fugitives, (who take to flight) under the pressure of sinful misdeeds, carrying the burden on their back. I know no one good for or useful to speak on my behalf to Thee, except my confident conviction that surely Thou does favour to them who turn to Thee to make a request, and makes sure that what they wish for is given to them. O He Who exposes the pitfalls of reason (if) awareness of Him is perceived; and makes speech meaningful (if) it sings His praises, and bestows benefits upon His servants that which serves the purpose, equal to what they have the right to. Send blessings on Muhammad and on his children; and let not Shaytan make a raid on my reason, and let not falsehood bring arguments to corrupt my conduct.